Los Angeles is one of the busiest cities in America, with its blooming industries: business, entertainment and sports. Roaming around the city, you will be delighted by food trucks, movie studios and high end boutiques. Among these establishments are online printing companies that provide high quality and affordable services. UPrinting is convenient for business and residences near los angeles looking for printing cost-efficient and durable posters. These prints are promotional and decorative, and are used to attract customer attention. You can use these in highlighting promos and special occasions. UPrinting provides wide range of options to choose from such as paper and size. Free templates with proper margins and bleeds with free human proofing are provided for your convenience. 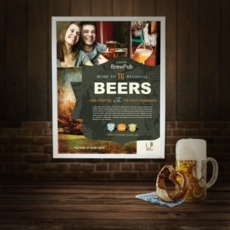 You can also do customize poster printing with the use of our online design tool that is free. Prints are made available in less than 2 business days. Choose among our three poster printing options: large format posters, bulk printing and mounted posters. Large format posters are used if you need to cover wide blank spaces and make them more attractive. Full-color poster printing is great for making bigger copies of family photos or for promoting products. These are available in standard and custom sizes. On the other hand, if your budget is tight, then you can opt to avail our bulk poster printing services. This is best for large-scale marketing campaigns such as new product information drives and product launches. Mounted posters are great for both outdoor and indoor advertisements. These are perfect as point-of-purchase display for business establishments. Imagine all the things you can accomplish with posters. Just be sure to choose the poster printing service that suits you!